I was Hanson's MOE 5 netpick! If you want to read about it look below. Here is how it looked in the MOE 5 magazine below! Thanks to Becka from the Hanson Hotel for scanning the pic for me! Thanks Hanson from the bottom of my little heart! I want to THANK everyone who emailed me and signed my guestbook with their congrats and all who still come to my site! I LOVE YOU ALL SO MUCH!! 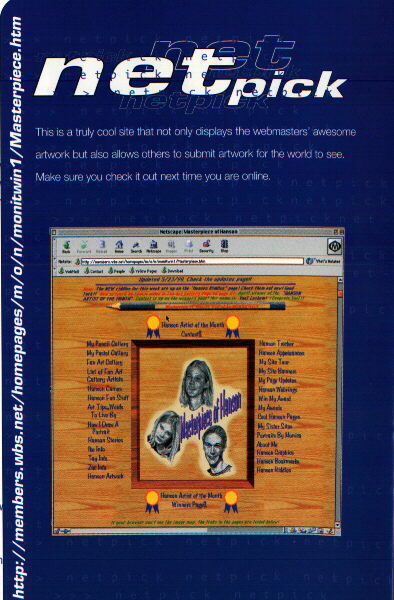 I hope everyone someday has Hanson choose their site as a NETPICK, because there are so many excellent Hanson sites that I have seen and gone to now and in the past! I know each one of us puts a lot of time and effort into their pages! Well let me thank ALL again from the bottom of my heart! I have made so many new friends!